2Line a jelly-roll pan or baking sheet with parchment paper; lightly coat paper with cooking spray. 3In a large bowl, combine popcorn and almonds. 4Combine sugar, syrup, butter and salt in a medium saucepan; bring to a boil. Lower heat and cook for 2 to 3 minutes, stirring occasionally. Remove from heat, immediately add peanut butter and vanilla; stir until smooth. Drizzle over popcorn; toss well. Spread popcorn mixture out onto prepared pan or sheet. Bake for 1 hour, stirring every 15 minutes. Cool completely. Tip: using a spaghetti server to stir works wonders. 5This caramel peanut butter goodness is perfect for homemade Halloween handouts. 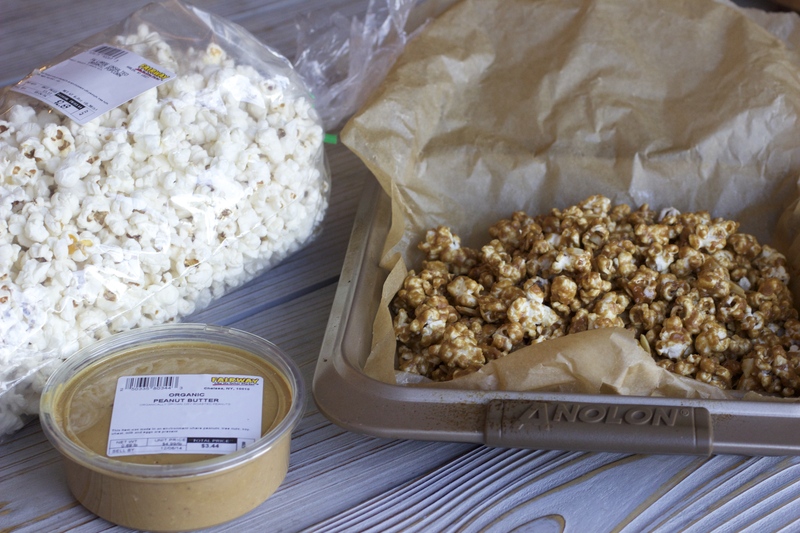 If you can spare some to share, be the talk of the town by making your own popcorn-filled Trick or Treat goodie bags! Luckily, this heart-healthy deliciousness can be easily made in large quantities! Or, simply be selfish and snuggle into a good movie with an upgraded popcorn snack!